Maybe the best reason yet for being happy that Obama was elected..! On the day before Thanksgiving, Barack Obama and his family helped serve meals to Chicago’s homeless at a Southside Catholic Church. After about an hour, Obama left the food line to go to an elementary school associated with the Church. 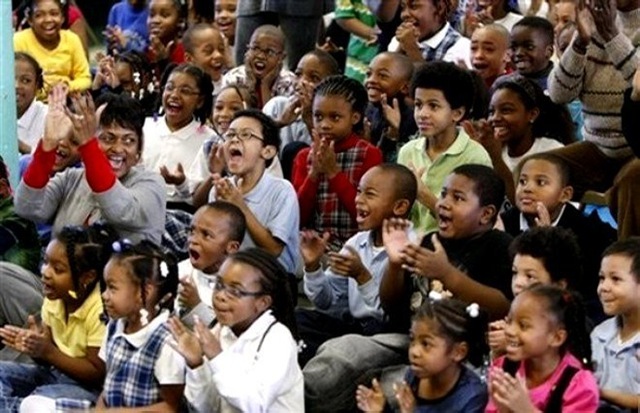 This AP photo captures the reactions of those kids who had only been told there was a “special guest” arriving. Look at every single face. Each face is the verse of an epic poem. Each expression is a note in a symphony. Here are a hundred eyes full of excitement and joy, and..(though these kids don’t know it yet their parents and grandparents do)..hope. This is the kind of Hope that straightens paths, brightens colors, and builds bridges to possibilities. It is the kind of Hope that I feel so grateful to have been able to witness, and even feel in my own heart. But, just look at these kids! Whatever I might feel is peanuts compared to the smiles, laughter, and amazement of these young ones. These kids are having their futures redefined- right now- in ways we could not have imagined that happening just three years ago. None of us know the full extent of the redefinitions or the long-term ramifications of the cultural reformation that has just taken place. But we do see those smiles, and those smiles tell me that whatever is coming next has got to be good. It has got to be. ← The World is a "Dirty Gas Station Restroom.."
Thanks so much for letting this image, this joy, this ecstasy dance before our eyes again. In the same way that the Celtic calendar has this time between Samhain on October 31 and the solstice on December 21 as something of an undefined dark spot on the calendar, November 5 through January 20 is sort of a weird no-man’s land. It is wonderful to get these little beacons of hope to help guide us through this crazy time of cabinet picks and senate seats for sale and the last death throes of Bush flavored doom. Love it! The little guy on the far right and bottom of the picture, trying to contain his excitement is my favorite! My favourite is the spectacled little lad at the back (bit left of centre) with the “Home Alone” gesture. If you could only bottle that ….